In a basement bar in New York City, nearly one hundred supporters of Howie Hawkins, the Green Party candidate for Governor, gathered to celebrate a historic election result. Despite the re-election of union-busting Democrat Andrew Cuomo, Hawkins and his running mate, Brian Jones, received nearly 5%, or 176,000, of all votes cast – a tremendous total marking the highest vote for a left candidate in New York state since 1920 when Socialists ran labor organizer Joseph D. Cannon for Governor. The impressive result moves the Greens from the sixth spot on the ballot to fourth for the next four years, overtaking the position previously held by the Working Families Party. How can we account for the historic success of the Hawkins campaign? Money and media were staunchly opposed to the campaign. While the Greens refused corporate money and received an average donation of $77, Andrew Cuomo amassed an election war chest of $45 million with an average donation of $70,723. In addition, the Greens faced an all-out media blackout during the final weeks before the election, as the New York Times and TV networks steered clear of any discussion of the campaign’s program. 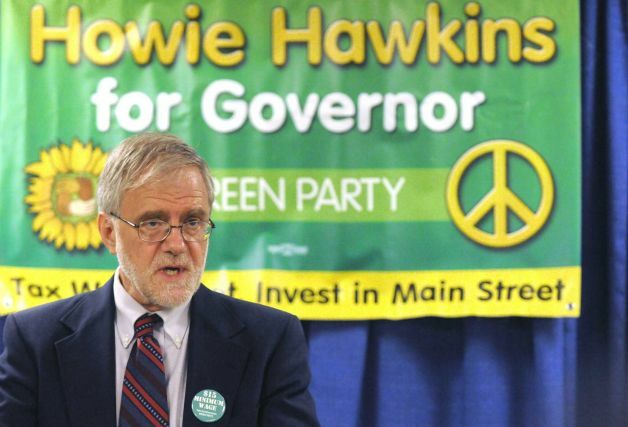 Hawkins’ success can be attributed to the appeal of a genuinely left alternative in an age of disgust with Cuomo, Democrats, and the two-party system. The campaign drew support from four distinct but overlapping groups: progressives unwilling to accept Cuomo, anti-fracking campaigners, public teachers’ unions and defenders of public education, and socialist activists uniting together under a bold left program. Together, these New Yorkers found voice in a Hawkins campaign opposed to the establishment agenda of inequality, privatization, and climate change denial. The election saw many progressives peel away from the Democratic Party and its echo, the Working Families Party which is backed by a number of key unions. Cuomo has ruled on behalf of Wall Street for four years – cutting state workers’ pensions, pushing school privatization, and blocking reform of Albany’s notoriously corrupt state government. Disgruntled progressives, sensing that “Governor 1%” was turning out to be a massive disappointment, first revolted in advance of the Working Families Party convention in May. Zephyr Teachout, a liberal Fordham Law professor, challenged Cuomo for the party’s nomination but lost out when Cuomo dispatched liberal New York City Mayor Bill de Blasio to clinch the nomination. De Blasio brokered a deal: In exchange for the Working Families Party’s ballot line (New York allows a system of “fusion” voting where candidates can appear on multiple parties’ ballot lines), the party got a video message from Cuomo and a happy list of IOU’s, including a $10.10 minimum wage and system of public campaign finance. However, these measures would only be possible if Democrats retook the State Senate. As the election neared, Cuomo not only broke his word on campaigning for Democratic State Senate candidates – he even voiced support for a number of Republicans. For many progressives, this was the last straw. Teachout continued her challenge to Cuomo in the September Democratic primary, polling an impressive 33% despite being outspent 40 to 1. On Election Day, with only one genuine alternative on the ballot, a large number of these “Teachout progressives” broke towards Hawkins. The revolt within the WFP and the Teachout campaign illustrate the growing fissures within the Democratic base. The WFP’s pathetic decision to endorse Cuomo, despite his palpable disregard towards it, was compounded when Republicans won control of the State Senate. The result allowed Cuomo to rip up his IOU of the WFP promises made in May – precisely what the Governor wanted all along. Yet again, the union leadership’s fealty to Wall Street-approved Democratic and WFP candidates led to disappointment for working people’s aspirations on Election Day. Hawkins’ campaign drew stronger than usual support from other quarters as well. Hawkins endorsed the 15 Now campaign for a higher minimum wage, and spoke vigorously of the need for clean energy, public housing, and mass transit. He was the only candidate clearly opposed to fracking, and polled up to 17% in counties like Tompkins where fracking is now likely to commence under Cuomo. In particular, however, his demands on education – including fully funding public schools and ending high-stakes testing and privatization – earned him the support of several teacher union locals upstate. He also garnered the key endorsement of Diane Ravitch, a nationally known opponent of corporate education reform. 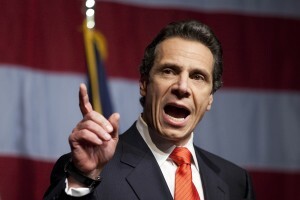 As if to enhance Hawkins’ appeal to educators and parents who have had enough of the attacks on public education, Cuomo was quoted bragging to the New York Daily News Editorial Board that he would “break what is in essence one of the only remaining public monopolies [public education],” once he was re-elected. With such wide support, the Hawkins campaign has proved an invaluable testing ground for future left interventions into electoral politics. Voters are angry and disgusted with the two parties of big business. 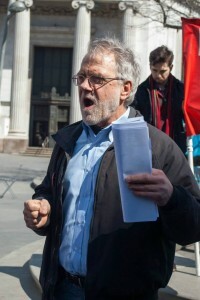 Hawkins articulated a program of radical reform that pointed towards the need to replace capitalism although he himself did not spell out that conclusion and his running mate, Brian Jones, is an open socialist. The two made frequent reference to their embrace of Socialist Alternative’s Seattle City Councilmember, Kshama Sawant, and appealed in forums for a united front of left activists to take on the two parties of Wall Street. fightback. Cuomo is clearly getting ready to approve fracking, but mass demonstrations and civil disobedience could make the ruling class think again. 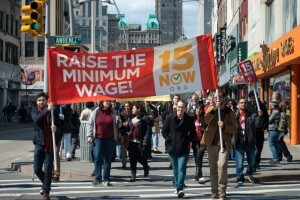 Likewise there are now serious expectations of a significant raise in the minimum wage in New York City, but Republican control of the State Senate is an obstacle to passing legislation giving municipalities the power to raise the minimum wage above the statewide level. 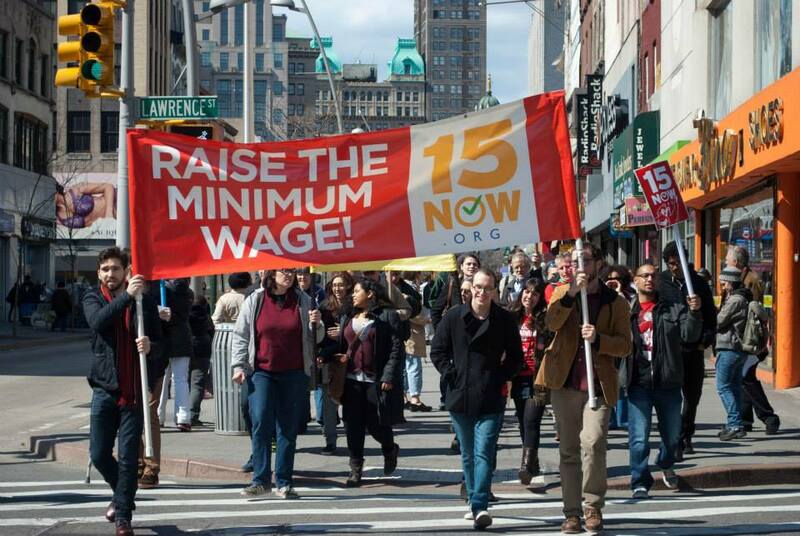 The time has come to build a mass campaign for $15 Now that will force their hand. The Hawkins campaign represents a breakthrough in the development of independent left politics in New York State. Building a serious movement against the political establishment could lay the basis for even bigger breakthroughs in 2016 and particularly in the critical New York City Council elections in 2017 . The Hawkins campaign has demonstrated, despite the relentless assault of big money and the submissive behavior of corporate media, that there is a huge space for serious challenges to the two-party duopoly. Post-Hawkins, electoral tremors and sharpening social struggle could soon turn into an earthquake.